As I had hoped, Midnight Crystal wrapped up the Dreamlight trilogy quite nicely without overdoing it with the repetitive 'Burning Lamp' and 'Winters Curse' legends. 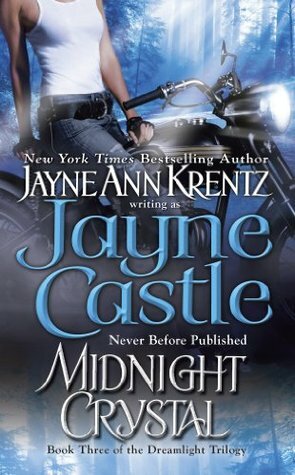 There were a few repeats of similar dialogue and actions from the previous two Dreamlight books, but overall, Midnight Crystal proved to be a standalone, and a conclusive sequel to the Dreamlight trilogy. As is usual for Jayne Castle (a.k.a. Jayne Ann Krentz), we still employ a lot of the same devices for the romantic relationship and the standard main hero and heroine. But as is also usual, I enjoyed myself enough not to get nit-picky about it. Once again, new psychic skills and alien discoveries were employed as part of the book's background; and once again, we get to see the interesting world of Harmony, as well as how well JAK manages to connect it to her contemporary and historical series, Arcane Society. But rather than hints here and there about a paranormal society from the 'Old World' on Earth, we make a big, distinctive connection by bringing in Marlowe Jones, the new boss of Jones & Jones, the paranormal private investigation company that works for the Arcane Society. Even Adam Winters' appearance was more Arcane Society than Harmony, which really DID make the book feel more like part of the former series than the latter. Castle's ability to somehow interweave the paranormal talents from Arcane Society with the newly developed alien psi talents on Harmony was actually handled quite well. I would love to see more of these interconnections, but as the Arcane Society series draws to a close, I'm not sure how much more of Harmony series will include Arcane. The book is enjoyable, well-written, and fun. I loved the characters, and even though this book mainly focused on Adam and Marlowe, I loved the potential that other side characters had. The main conflict of the book wasn't all that interesting, as it progressed along the same lines as the previous two books in this trilogy. The rest of the story felt like there might have been more than one main conflict, which also progressed along the same lines as the rest of the Harmony books that came previously. What saves these books from being overly repetitive are the new developments in the world and the story line. But otherwise, the romances are always the same, the general book outline is typically standard, and everything is a little predictable. But nonetheless, I always enjoy myself. One thing that stood out, though, was Marlowe's assertion that Jones & Jones was no longer a unique, stand alone paranormal private investigating agency. With the development of paranormal and psi abilities in Harmony, the idea of psychic ability became a normal part of everyday life. And so any old paranormal private investigator would promptly become just any old regular private investigator. And even while Jones & Jones still gets most of its work from the Arcane Society, they are now in a greater competitive scope with many other private investigators who can do the same kind of work that Jones & Jones can do. I thought that that was a nice touch, considering how secretive the agency had to be throughout the historical and contemporary time lines. Meanwhile, I never tire of Castle's tendency to also insert some dust bunny moments that just make me feel all smiley and fuzzy. Gibson wasn't really all that unique when it comes to dust bunnies, but he was still a wonderful addition--I can still picture the scene at the beginning of the book where Marlowe finds him a nice piece of deadwood to use as a surfboard in one of the alien underground jungle pools.